This is a compilation of oddball ways to earn money that just don't “fit” into other categories. I have researched these and determined they are legitimate to the best of my knowledge, but I cannot make guarantees. As always do plenty of your own research before pursuing any opportunities you see listed here. 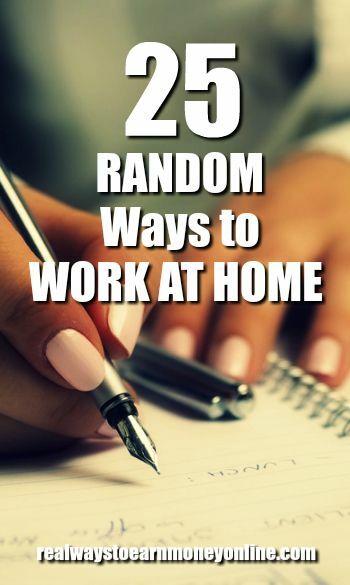 10EQS – Occasionally has openings for work from home researchers. Preferred qualifications include great English skills, experience with MS Office, and a business degree or business experience. Art & Logic – Hires work at home software developers with experience throughout North America. Relocation is not required. Aria Communications – This is home-based handwriting work. You do have to train on-site for 20 hours at their office in St. Cloud, MN before you can work at home. Admissions Consultants – Hires people with good interpersonal skills and admissions committee experience to become work at home consultants. Abilto – Become a work at home therapist or behavioral coach for Abilto. Requires phone and/or webcam. Article One Partners – This company hires people to do technical literature research from home. ath Power Consulting – Regularly hires remote mystery shopping schedulers, but you will have to be located in either Mass. or New Hampshire. If the job is not posted on their website, you can check Craigslist for it. They also post openings there. BetterUp – This company hires work at home coaches for leadership skills. They do require you have experience and a degree. CallSource – Read Review – Work as an independent contractor listening to recorded phone calls and scoring them based on the company's criteria. Pay is per call. Decorist – Work at home as an interior designer for Decorist. Get paid for all your design time, plus earn rewards through their incentive program. Frontier Data Gather – Become a data gatherer for Frontier Data Gather. This is on-demand work that pays with Paypal. Some of the data needed will require local travel for you. Most payments made are between .25 and $10 just depending on the types of tasks you do. Ginger.io – Read Ginger.io Review – Work at home as a “listener” for people who call needing to talk. Must have counseling/therapy experience. Impact Interview – Work at home anywhere in the US as an interview coach and help people ace their job interviews. Intellishop – This is a mystery shopping company that hires work at home quality assurance specialists to look over submitted shopper reports. Sometimes this job will involve phone communication, so you need a distraction-free environment to work in. You have to train the first few weeks in the company's Perrysburg, OH office. Kirkus Media – This company has frequent openings for book reviewers. English and Spanish language titles. Freelance, work from anywhere. Mendr – Read Review – This is an app that you can use and get paid to edit photos. Claim the assignments you want to do, then cash out to Paypal. Coupon Chief – Read Review – Coupon Chief is a way to earn by uploading the coupon codes you find. Humanatic – Read Review – Work at home listening to and categorizing recorded phone conversations. OnSource – Get paid to do inspections on vehicles and other property for insurance companies. JustPark – Have an empty spot in your driveway? You could be making money by renting it out. Red Vision – Has work from home title searching and typist positions available almost all the time. Reynolds & Reynolds – Read Review – Hires work from home call analysts to listen to recorded phone conversations to check for missed sales opportunities. Seems similar to Humanatic (also listed above). Saving Star – Read Review – Earn money just for using your grocery store rewards cards. Pay out is low at $5. Get Paypal, Amazon, bank deposit, or charity donation. Shop Your Way – Become a Shop Your Way personal shopper and earn extra money. Shutterstock – Read Review – Occasionally has openings for remote image reviewers in various countries. Stitch Fix – Read Review – Work from home as a stylist for Stitch Fix, a clothing subscription box service. You will have to be in the Bay area so you can attend training and orientation in person, but the rest of the work is done from home. We Go Look – Get paid to check things out for people. Up to $25 per task, payable by Paypal.